As of right now, there's only two options to adjust borders for your profile, default is the same as custom aside from the fact you can't change its color. Is it possible to get new patterns and/or different types of borders for your profile? Monotone: Simplistic and only has a single color with no patterns. Much like coloring your border black. 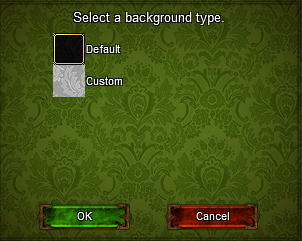 I'm planning to add some more options, both as general selectable or unlockable options, and as donation item options. If anyone has any more suggestions for borders/etc they'd like to see, feel free to share them. If you posted the details of what kind of size and format it needs to be it would be relatively easy for people to submit new ones right? Noxid wrote: If you posted the details of what kind of size and format it needs to be it would be relatively easy for people to submit new ones right? Agreed, as for actual options. Border Size - Can be set between a value from 1 to 3, with 3 being the thickest. Default Text Color/Font - Lets you change your name's font on the side and the font of your equipment text maybe? Monotone - Self Explanatory, one flat color similarly to setting your border black. Top/Bottom Opaque/Invisible - Needs a more clever name but could allow for some neat ''custom borders''. Could be donation? Blank - no special pattern. I could upload a psd or something if people are interested in submitting new ones. Neus wrote: I could upload a psd or something if people are interested in submitting new ones. I agree with Miller, that would be perfect. Alright, here you go. Post anything you want added in submissions. If you have any questions, let me know. What about backgrounds? Is there a particular size they need to be?